One dealer wins House race; a second chance for another? Mike Kelly got into the race after learning last year that his Cadillac franchise was slated for termination by General Motors. DETROIT -- A third dealer challenger will be on the congressional ballot come November. Mike Kelly, a dealer in Butler, Pa., won his primary race yesterday for the Republican nod in Pennsylvania’s 3rd District. Kelly will take on Democratic incumbent Kathy Dahlkemper in the general election. He owns Chevrolet-Cadillac, Hyundai and Kia stores. Kelly got into the race after learning last year that his Cadillac franchise was slated for termination by General Motors. GM sent him a reinstatement letter in March. In Indiana’s 3rd District, Ford dealer Bob Thomas lost his primary race for the Republican nomination a couple of weeks ago. But the winner of that race, incumbent U.S. Rep. Mark Souder, announced yesterday that he would resign after an affair with a staffer became public. Thomas told an Indiana television station yesterday that he is still interested in being a candidate. “I poured my heart and soul into this campaign and am considering going again,” he said, according to the station, Indiana’s NewsCenter. 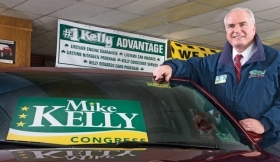 Kelly joins Ohio dealers Tom Ganley and Jim Renacci as dealer challengers who will run as Republican nominees in House races this fall. Renacci is about to become a former dealer. He announced last Friday that his dealership, Wadsworth Chevrolet, would close in June. GM had targeted the store for termination. Another car dealer challenging for Congress -- Scott Rigell, a Virginia Republican -- faces a primary vote in June. The House already has three current or former dealers among its ranks, all of them Republicans: John Campbell of California, Bill Shuster of Pennsylvania and Vern Buchanan of Florida.